Almost every time I ask my husband what I should make for dinner his response it, “Mac and Cheese.” I am trying to come up with some unique ways to enjoy mac and cheese. This week I have decided to add Chicken and Corn to the mix. 1. Start cooking your pasta according to directions. 2. While you pasta is cooking, heat a large skillet, add oil. When oil is hot add your chicken. Cook 10 minutes, then remove. 2. Bring your skillet back up to heat, add a little bit more olive oil. When oil is hot, add your onions. Cook 5 minutes, until browned. Add celery, red bell pepper and corn. Cook 5 minutes. 3 Add the flour and cook 1 minute. Add the stock, then the milk, then the spices. Stir until the milk bubbles, add the cooked chicken. Cook one more minute. 4. Transfer to large bowl. Stir in the cheese until it melts. 5. Toss the drained pasta with the cheese sauce and serve! I love this salad! It is a great combination of creaminess and crunchiness, savory and sweet. To top it off, it’s healthy! 1. If you have a gas stove, turn one of you burners on high and stick your corn directly on the flame. Turn the cobs occasionally until all sides are blackened. Let your corn cobs cool a bit, then cut corn from the cob. If you do not have a gas stove, simply cut the corn from the ears. 2. I think this salad is best if you make them individually. I have found that avocados don’t mix well with spinach. So, first place spinach on your plates or in your bowls. 3. 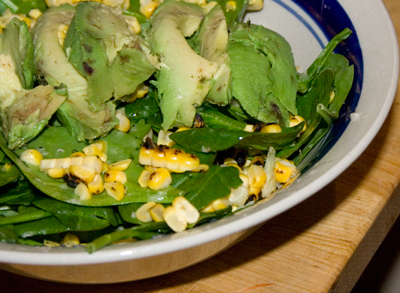 Top with slices of avocados, corn, and onion. 4. Drizzle the top with lemon dressing. This is a Vegetarian Recipe! 1. Slice tops from peppers; remove seeds and white membranes. 2. Put peppers in a large saucepan; cover with salted water. 3. Cover pan and bring to a boil. Boil for about 5 minutes; drain and set aside. 4. Combine remaining ingredients; spoon into drained green peppers. 5. Place in baking pan and bake in a preheated 350Â° oven for 35 to 45 minutes or until done. 1. Season chicken breast with salt, pepper and lemon juice. Let chicken marinate while you get the rest of the meal set. 2. Heat a nonstick skillet over medium heat with 2 TB of olive oil. Add potatoes in even layer. Season with salt, pepper and thyme. Let the potatoes alone for 2 minutes. Stir in onions, and garlic and continue to cook, stirring occasionally for 7 minutes. 3. While potatoes and onions are cooking, preheat another large skillet with 2 TB olive oil. Add chicken breasts and cook 10 minutes on each side. 4. After 7 minutes of cooking potatoes and onions, add corn kernels to pan. Cook 3 minutes stirring constantly. Add chicken stock, turn heat up to high to bring stock to bubble. Cook for 3 minutes. Turn heat off and add the butter, parsley, and lemon zest. Stir until butter is completely melted. 5. Serve chicken whole or sliced on top of corn and potatoes.